Freshii Inc. held an initial public offering on Wednesday and intends to list on the Toronto Stock Exchange. In going public, the company behind the growing quick-serve concept positioned as a healthy alternative to standard QSR fare laid out an aggressive growth plan for the next three years. 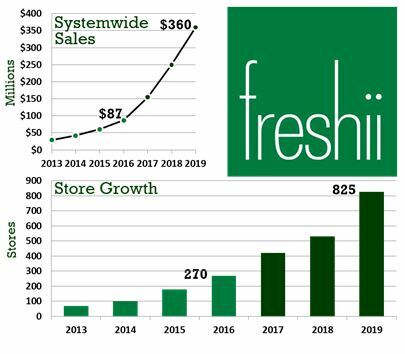 Freshii’s current portfolio of approximately 270 stores (about 80% of which are located in the US and Canada) is slated to grow to more than 825 locations by the end of 2019, and the company projects systemwide sales will quadruple in that timeframe landing somewhere within the $355 million to $365 million range. Annual same store sales growth in this period is projected to be between 3% and 4%. Historical Data Source: Chain Store Guide’s Database of Chain Restaurant Operators. CSG projections (2017-2019) based upon company statements. Actual figures are subject to change. This data is not intended for investment decisions. The company attributes a large part of its success to its flexible real estate model. Stores range in size from 300 square feet to 2,500+ square feet. According to CSG’s Database of Chain Restaurant Operators, stores currently average 1,200 square feet. Freshii features both traditional and nontraditional outlets (with a growing number of nontraditional units located in Target stores). Chain Store Guide’s Database of Chain Restaurant Operators features personnel listings and contact information for more than 20 top Freshii Inc. decision makers, including the C-level suite. Joining Freshii in the database are 8,800 additional restaurant companies across the US and Canada with listings and contact information for the 33,700+ men and woman who run them.